Agricultural Research Service (ARS) scientists are looking for ways to improve housing for farm animals, including pigs. Enhancing the animals' environment can help reduce stress, which in turn can improve growth and efficiency and decrease disease susceptibility. According to the World Organization for Animal Health, animal diseases cause losses of at least 20 percent in livestock production globally. That represents more than 60 million tons of meat and more than 150 million tons of milk—valued at around $300 billion per year. 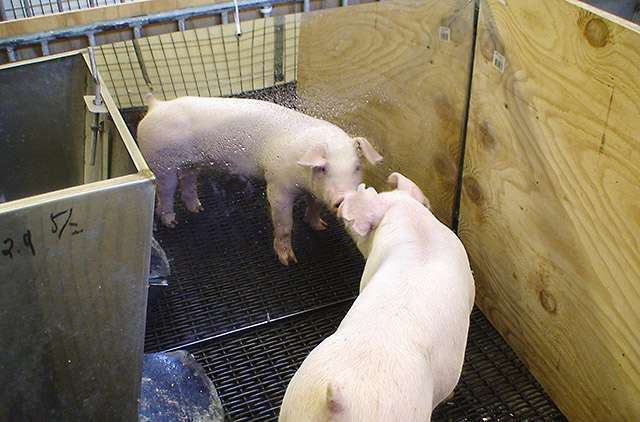 To find ways to improve pigs' well-being and productivity, animal scientist Jeremy Marchant-Forde, former Purdue University graduate student Shelly DeBoer, and their colleagues examined the types of pens in which the animals spent most of their time. In the study, pigs had access to a standard rectangular pen with a metal floor and solid sides (the "control" pen, used for comparison), a pen with a rubber mat on the floor, another with a mirror on the wall, and a fourth that had a barred gate with a view of another pig across a passageway. "Pigs preferred to spend about 40 percent of their time in the pen where they could see the other pig," Marchant-Forde says. "They spent about 10 percent of their time in the control pen and 20 and 30 percent, respectively, in pens with the mirror and the mat." In a second analysis, each pen was categorized as "social" or "nonsocial." The pens with the mirror and view of the other pig were in the social category, and the control and rubber-mat enclosures were in the nonsocial category. The scientists examined which of these pens the pigs preferred when a person was present or absent. "When undisturbed, pigs only slightly preferred the social over the nonsocial pens, and the pen across from the other pig was clearly used more than the pen with the mirror," Marchant-Forde says. "When a person was present, pigs spent nearly 90 percent of their time in one of the social pens, and the mirror was as popular as the companion." The pig's own reflection in the mirror may be perceived as a companion pig, offering support at stressful times. The mirrored pen may also be useful in improving a pig's ability to cope with stress when housed alone, he adds, but more research is needed for confirmation. In commercial farming, using a mirror becomes less important because pigs are kept in groups, Marchant-Forde says. However, rubber mats could help improve the pigs' environment, which may help reduce stress and thereby enhance production efficiency.